1. This was not a protest against the opening of the American embassy in Jerusalem. There have been 6 weeks of reported and well-orchestrated riots on the Gaza border. These were always intended to culminate on the 70th anniversary of what the Palestinians call the “Nakba”, or the “catastrophe”. This was when the modern state of Israel was born, under the auspices of the UN, and its Arab neighbours instigated, and lost, a war to eradicate Israel. 2. Neither are the riots against the blockade of Gaza (imposed by both Israel and Egypt as a security measure). If they were, it would make little sense for the Gazans to set fire to the gas pipeline and infrastructure that delivers fuel and gas from Israel to Gaza, or to burn the terminal that receives humanitarian aid. 3. The seemingly innocuous label of “protest” disguises the fact that Hamas’s “Great March of Return” was in fact an attempted infiltration of the border that, had it succeeded, would have led to a massacre of Israeli civilians. Hamas explicitly urged participants to breach the border and slaughter as many Israelis as possible. One of the places Hamas attempted to breach is adjacent to the kibbutz of Nahal Oz, just a few hundred yards from the border — a dash that could be achieved in 5 minutes or less by those intent on slaughter. Hamas circulated information showing the shortest routes to Israeli communities over the border, and urged participants to bring knives and guns. 4. Not only were there knives and guns, Gazans brought meat cleavers, fence-cutters, rocks, Molotov cocktails, grenades, kites with incendiary materials that set fire to Israeli farmland, and set explosive devices at the security fence. 5. The IDF dropped leaflets on Gaza, telling them to stay away from the border, and rang bus companies to tell them not to take people to the border. As photos and footage clearly show, the IDF used tear gas to repel the attacks, as well as rubber bullets. 6. The IDF has reported that 50 of the 60 reported to have been killed were members of Hamas and Islamic Jihad, both terrorist organisations and recognised as such in New Zealand. 7. The Gazan Ministry of Health (ie. Hamas) has reported that 6 minors were killed by gunshot. If this is so, why were children brought to volatile riots that the IDF told Gazans to stay away from? 8. 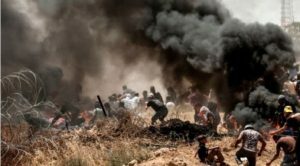 While any loss of civilian life is regrettable, the numbers – 36 among the 40,000 who were estimated to have amassed at the border, and 1,359 said by the Ministry to be wounded from live bullets, – clearly demonstrate that the IDF exercised restraint and did not indiscriminately apply a shoot to kill policy. 9. Can any person condemning the number of deaths offer a suggestion as to what non-lethal measures can be effectively deployed against intended mass border breaches and massacres? In just over one hour, the IDF recorded five explosive devices at 12:53 p.m.; another bombing attack five minutes later; six terrorists taking cover among the rioters at 1:15 p.m., opening fire at IDF soldiers; another shooting attack at 1:30 p.m., and another 15 minutes later, this time by eight armed terrorists; three explosive devices detonated at 2:09 p.m.
10. Hamas, which oppressively rules Gaza, is recognised as a terrorist organisation around the world, including in New Zealand. It is backed by Iran. The IDF has reported that Iran, which repeatedly calls for Israel to be wiped off the map, said it would pay every participant $100, and Hamas has forced women and children to participate in the riots. East of Gaza city, Hamas announced that Israeli soldiers were fleeing their positions, even as the IDF was reinforcing them. No responsible government which values the sanctity of life would encourage or force its people into such a situation. Hamas’ tactics, including its targeting of Israeli civilians and use of civilian shields, are well-documented. Gazans are actors in a gruesome theatre, dying and being maimed to provide Hamas with staged photo opportunities with the aim of isolating Israel, and boosting its own flagging popularity. Media and politicians, including New Zealand’s Prime Minister Jacinda Ardern, who condemn Israel while uttering not a word about Hamas nor calling for the Gazans to refrain from violence, have fallen prey to this cynical propaganda. Whether through laziness, ignorance, the bigotry of low expectations, prejudice against Israel or a combination of these things, such elites embolden a savage terrorist organisation to continue with its path of destruction, and are complicit in the inevitable loss of life.